Ninja Ways slot certainly impressed upon opening with a big grid and and eye-catching scene behind the reels of a nightime old Japanese town in which the Ninja tradition once flourished. I don't have to tell you the music we get to hear as we spin therefore although it is drowned out by the trademark Red Tiger springy sounds as you spin and stop the reels with some dramatic cymbal crashes when wins appear. Play'n Go made a notable Ninja-themed slot with their Ninja Fruits and we must hope this game can match that for excitement. The trouble is, those swords are terribly sharp and this time it's not fruit that can be slashed in two, but our bankroll. 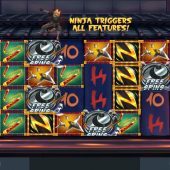 Ninja Fruits has 4096-ways to win and therefore has 6 reels of 4 rows each as you may have seen with Buffalo Blitz and Raging Rhino. The symbols are stacked and pays not bad considering the ways that are possible on any one spin. You don't see Wilds on the reels as they amy appear later, but the 6-of-a-kind pays are 8x stake for the top N symbol, 5x for the Trident, 4x Death Stars, 3x for Nunchuks with five card values from 2.5x for Ace down to 0.8x for the 10's. Your scatters also appear stacked on all reels but we'll come to that shortly as I'm sure that with this theme Red Tiger have a few spectacular in-play events to display! Ninja Doors - a Mega symbol which can be 2x2 to 4x4 will be created behind these doors for a guaranteed win. Ninja Wild - The Ninja darts across leaving a Wild in his wake. This may not sound great, but it will have a random multiplier of 2 to 8x. Ninja Ways - the Ninja arrows himself across the grid to leave a trail on higher-paying symbols in his wake. He can make 2 or 3 diagonal lines of the m too and it's rare a win won't be granted as a result. You will have seen stacked scatters on the reels and we need 5 or more in view to trigger the free spins. This may sound easy, but they must be on consecutive reels from the left, so you could get four on reel 1 and two on reel 2 for example which would be a 6-scatter trigger. Each scatter reveals a number of spins between 1 and 5. This is what you begin with and naturally the Ninjas are more frequent during them, especially the harder to get block Ninja Doors one. 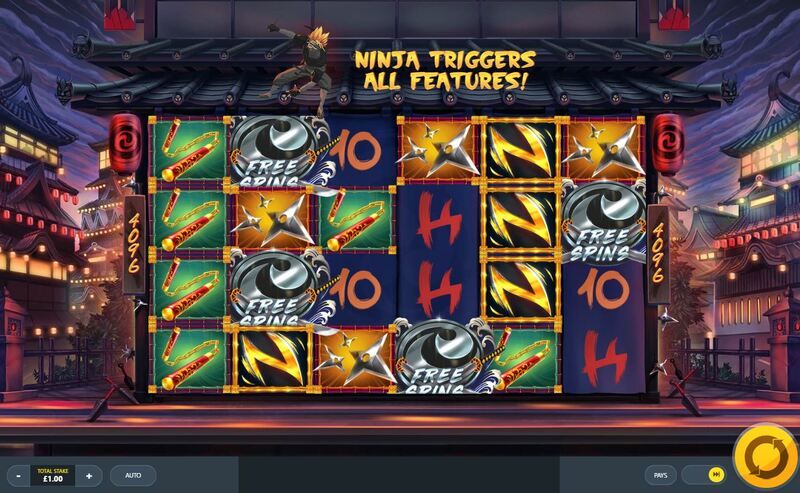 You will also be given extra spins for any scatter landing during them anywhere on the grid and the Ninja may even add a spin or two when doing his thing too!